Friday, December 22, 2017 at 2:15 p.m. When it comes to facial hair, Spokane police are limited to growing just mustaches and short goatees. But in November, patrol officers had a chance to ditch their razors for a worthy cause. “I think one of our officers, David Kaurin, came up with the idea. He presented it to Chief Meidl to do this to support a charity. The charity he selected was Community Cancer Fund,” explained Major Kevin King. About 40 cops donated a minimum $50 to put “the fuzz” back into police work. As soon as the money changed hands, the beards starting getting longer. “One of our female detectives, wanted to be part of this as well. So she made the beard growing challenge interesting by offering to donate $250 to whoever won the contest,” said King. 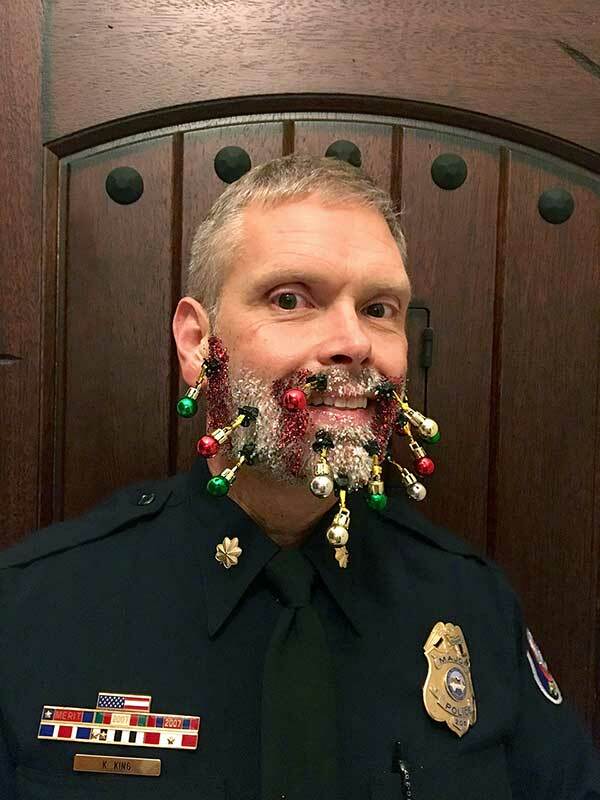 The public went on-line and voted Major King’s decorated beard the best of the bunch. King then promptly donated his winnings to the Community Cancer Fund as well. “On the behalf of the Spokane Police Department and in honor of No Shave November, I would like to present to you, this check from the Spokane Police Department for $ 3,550. I want to thank you for everything you do for our cancer patients in the City of Spokane,” said Chief Meidl when handing over SPD’s contribution. Police picked Spokane’s Community Cancer Fund because officers feel when you’re battling a disease, the last thing you should have to worry about is money. Jerid Keefer of the Community Cancer Fund says contributions are shared with cancer patients in the form of gas cards, help with medications and things like lodging initiatives. Keefer said he appreciates the department’s donation and what police officers do for us every day. “The fact that the Spokane Police Department does so much for our community but then would take the next step and help the Community Cancer Fund is just really, really cool,” Keefer added.